Hideo Kojima's portable next installment in the Metal Gear Solid series will be hitting Japanese shelves March 18th, and a Western launch probably won't be far behind. I have to admit, as someone who doesn't have a PSP, MGS: Peace Walker has been passing way beneath my radar. But I do know some people - including Escapist newsie Tom Goldman - who just can't wait to Walk for Peace, so here it is: The latest issue of Japanese uber-game-mag Famitsu reveals that the PSP game will be released in Japan on the 18th of next March. It's interesting that the only information given is about a Japanese release date, considering that MGS traditionally does better in the West, and the release dates reflect that. 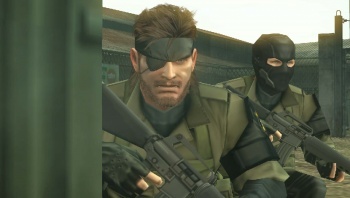 Metal Gear Solid 4 had a worldwide launch last June, and MGS3 came out in North America a full month ahead of the Japanese release (November and December 2004, to be precise). Peace Walker's direct PSP predecessor MGS: Portable Ops also came out in North America before Japan by two or so weeks - in fact, the only relatively recent Metal Gear games to see an initial Japanese release have been the two Metal Gear Ac!d titles. Still, even if we won't be getting Peace Walker before Japan, it's unlikely to imagine that it'll be too much longer before Big Boss sneaks into Western stores, too - I'd say May, maybe June at the absolute latest, but probably well before then. So get ready to mark the date with a big, solid "! ", MGS fans!